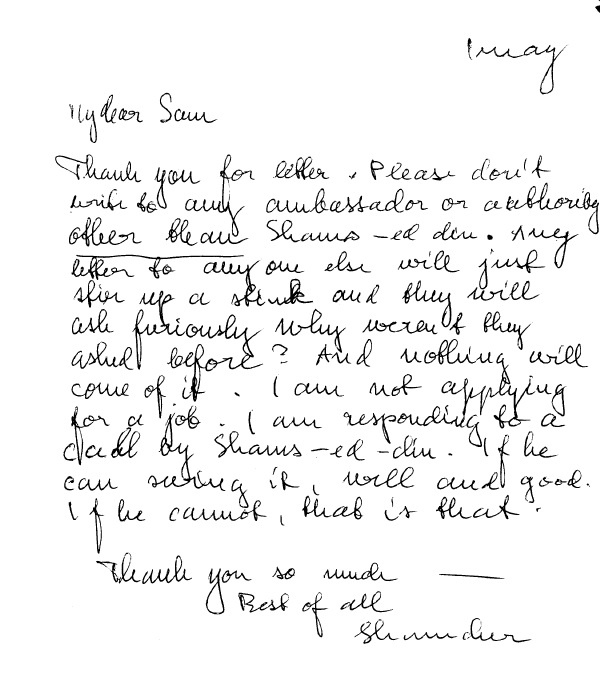 A letter from Samuel Lewis and Shamcher to Congressman Engle in 1955. THE SOLUTION OF WATER PROBLEMS AS AN AID TO PEACE IN THE NEAR EAST. I was a resident of Marin County for about twenty-five years and for a long time enjoyed the friendship of the Hon. Clarence Lea whom I understand was also a good friend of yours. I have also been attending the American Academy of Asian Studies almost since its inception and recently met your daughter, Yvonne. In a certain sense I see an excellent future for Yvonne if some of the ideas or suggestions contained in this letter are effectively manifested in the world of today with its turmoil and confusing problems. In 1946 I visited Washington and Clarence thought enough of me to cancel all engagements for the day. The rest of the time was spent in a plan I had for preventing any outbreak in the Near East which could only redound in Russia’s favor. Congressman Lea gave me all necessary introductions but I must say, contrary to what comes out of other people’s mouths, that I never had to cool my heels any where, any time, on any of a dozen visits to the Nation’s capitol. I also spent two hours with the Hon. Norris Poulson, now Mayor of Los Angeles, who was once my next door neighbor when I lived in East Hollywood. Also one hour with the Hon. Carl Hinshaw whom I knew personally when he was in the real estate business, long before he was ever elected. As Congressman Hinshaw has been the chairman of the Interstate and Foreign Commerce Committee and as he has introduced bills for a department of science I thought he might be interested in some of the ideas presented herein, but that has not been so. Altho I met no obstacles in Washington because I happen to have some pretty good background (you can check this with Yvonne, too), the death of my principal forced me to return to California. Then measures were taken which brought the Zionists and Arab States into all but open hostility, and sometimes that. The result has been that I have kept very, very quiet. The only time I have said anything was in secret to one of the instructors at the University of California and he wanted more. 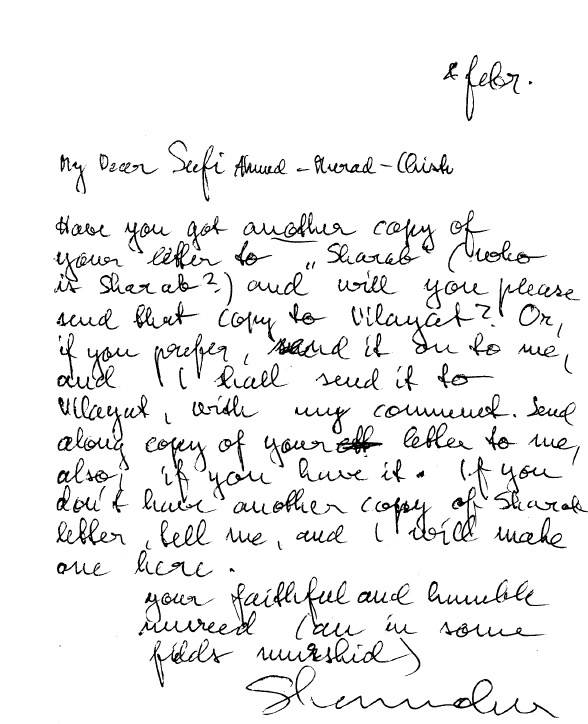 I wrote a number of times to the Vice-President’s office after his visit to the Orient but the net result was an invitation to contribute to some Christian missionary outfit to combat communism — which ignores the feelings of hundreds of millions of people. In the past few years a very close friend of mine, Mr. Bryn Beorse, has returned to California and has been engaged in research for the University of California, both at Berkeley and Los Angeles, upon some new methods of obtaining water from the ocean at a comparatively low cost both for agricultural and potable purposes. Mr. Beorse is Norwegian by birth and is a man of some renown. He has been a war hero and is known personally by not a few members of the diplomatic corps of several nations. He told me in part of what he has been doing and what is being tried out by the Engineering Department of the University. We have been trying to ‘sell’ the general plan to Pakistan which has aggravated water shortages in their western provinces. The political upheaval in that land has delayed any final action. In the past year I have spoken quietly to several persons, Arabs and Zionists, who have been at each other’s throats, and asked them what the solution of the water shortages would mean for them. I was surprised to learn that some of the most vociferous anti-Zionists suddenly became quite peaceful when I told them that there was a possibility of obtaining water from the Red Sea, and other places, which was available at a low cost. I also presented the same idea to one of the Egyptian consuls-general; he was not interested but has since been recalled. Now two situations have arisen, the first of which I invite to your attention. There is a plan for a huge dam south of Assouan in Egypt. The estimated cost is $500,000,000. This money is not available at either the World Bank or any of the lending agencies of the U.S. Government or private banks; there is, however, the possibility of a combination of these agencies raising the credit. But Russia has come forth with a counter-bid. There is some question as to whether Russia has either the financial or engineering resources to carry on the project. There are some further factors involved. The Government of Soudan would not consent and the status of that land is in doubt now which would delay the project. The Muslims, even when anti-American, simply do not want communists in their midst. This brings up an alternative. It may be possible to establish one or more plants in the Red Sea or elsewhere in the Near East at a cost far below the above estimated $500,000,000. And in addition to that it is quite obvious at this writing that Russia has no low-cost salt-water derivative plan. If the method being tried out at the University of California would receive national attention, if not national backing, this country would be offering a form of cooperation to the Muslim world which would gain the good-will of several nations which are either double-dealing with us or are downright suspicious. I am wondering what you think. The second situation is the possibility of having a plant somewhere on the southern Oregon Coast–I am suggesting that from what little I know of the method of operation. This might entirely change the tenor of local California politics into which you have been involved with much more heat than light, at least on your opponents’ side. If the populous districts could obtain water from the ocean it would not only relieve your constituents, it would help preserve some of the natural beauties of California.